When learning Rust you often want to write some small program to experiment. In this case, I use a service called Wandbox made by a Japanese. 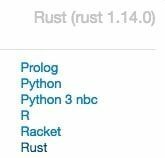 Rust is a language still in development and sometimes change the language spec: some code suddenly becomes compilable for ergonomic reason and some code becomes deprecated. You want to change the compiler version in this case. Wandbox is not ready with 1.33.0-dev and other older 3 versions. On the other hand, Ideone only supports 1.14.0, pretty older version. As said above, Ideone supports 1.14.0 and it is pretty old one. It is like 2 years ago when it was released. When you run a code in Ideone, you are moved to other page to see the result. If you want to modify the code and run again you need to press edit button but it is actually stressful. In Wandbox on the other hand, you are able to modify the code and rerun in the same page. Also, a shortcut key bind CTRL+ENTER is available which is pretty useful. Ideone's editor doesn't auto-indent and you feel hard when writing your own code from nothing. In Wandbox on the other hand, auto-indenting is implemented and you can write a code of 100 lines without hardness, which is enough for experiment.